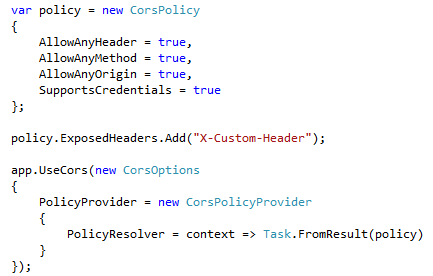 In a development environment it may be handy to enable CORS for testing. Sometimes you need to expose custom headers as well. So let’s get our Access-Control-Expose-Headers’ing on. We can see that all it is doing is creating a custom CorsOption object for us with some default settings. The meat of the configuration is located in the CorsPolicy object. You’ll notice one particular property of CorsPolicy that is of particular interest of us: CorsPolicy.ExposedHeaders This read-only list contains a collection of headers to expose via Cors. It has been a few years since I have shipped a product. In 2009 when I started to build out a question and answer engine I feel into the “If you build it, (and post it to Hacker News) they will come” mentality. Even though I knew that marketing a product was an important part of process I felt that I could ride off the initial “launch” for quite some time. During the first few months the product was up and running learned that the idea of a launch was as much as a fallacy as my idea of how to “market” a product was. Although the software still lives on in the Open Source space I never held the product, or myself, to the standard that I wanted. That is a mistake that I do not want to make as I venture into the realm of producing products in the future. Since you are reading this post I believe that you must be interested to some extent about me or learning how to build your own software products. As I begin the process of building out a new piece of software I am going to take you on the journey with me and hopefully you can leverage the areas where I took the right turns and learn from my mistakes. Building a successful product is not just about building great software. It also involves marketing, customer service, networking, and most importantly creating value for your customer. Before can start thinking about any of those elements I have to first come up with an idea. After reading a few items online it looked like there could be an issue with phpsize. Looking into XAMPP phpsize is not included by default. Taking a somewhat ill advised route I installed mac ports and attempted to port install php5-devel. As it began to compile I realized the error in my way: it was porting php5 as well! To finally fix the issue: I hopped onto the Apache Friends XAMPP page to take another look, and before my eyes I saw the XAMPP mac “Developer Package.” After downloading and installing the .pkg I attempted to run pecl install oauth again and it was smooth sailing. After a long hiatus from working on Dragon Duel I believe it’s time to kick things into action. Over the past two years Dragon Duel has faded in and out of my memory, and for good reason. These last two years have brought major ups and downs to my life. Some of these events have caused me tremendous pain, others pure joy and love. When I started working on Dragon Duel in 2006 the world I lived in was untouched by the realities of life that set as your responsibilities grow. Because of this my world went from working on projects I was passionate about, like Dragon Duel, to working on applications for different companies. And while that type of work does bring bread to to the table, it also chips away at your passion and dreams. Dragon Duel was taken offline because of a series of issues: I no longer had the time to manage it properly, the economy was busted, the back-end of the game was a bit screwy, and a slew of other issues. Tian and I felt temporarily shutting it down was better than letting the game run amok. Since the time Dragon Duel has gone offline there has been multiple attempts to get it back online. Doing this however is not an easy task. The game has to be rebuilt from the ground up. By doing this, the game will ultimately be creating a new game. By going down this path the walls to getting the game back online stretch higher into the sky. However, there is hope. Some sections of the game have been completed: Battles, weapons, some basic training, a new interface. There is still a long path ahead of us to get the game back online but we are determined to do it. To stay on this path we would like to hear from you: Keep us in line, Ask hard questions, and let us know what features you would like to see. I am going to try and commit myself to writing at least one update per-week on how the development of the game is going. I want to let you into our minds and see how our development process works. If you have any questions along the way I want you to ask them and I will do my best to answer them for you. See you next week. Please let me know what you think below. So after my still developing issue, I went out trying to find some additional freelance work to help build up my portfolio and put some money away in the bank. I wanted to skip the oDesks and outsourcing sites and go for something I thought may be a bit better: Job Boards. So I checked out the 37Signals Job Board and found this post. How the brief was written scared me a little, but 37Signals charges a pretty decent amount to post a listing so I figured it was all going to be kosher. I added them to my list to contact and a few days later we spoke. Do you have a merchant? I’m sorry? For payments/my invoicing? My myself I use PayPal and invoice through FreshBooks. Out of curiosity, why not? I will have to look into another option. What if we run it through 99designs? Because that isn’t the way business should be done. paypal isnt the end of the universe, paypal is where i lost about 4 grand last time i used it. Because 99Designs is used for contests. There is a slew of things you could do to cancel out the process along the way. I have to protect myself here as well. I will start the contest and give you the login details for the account and you can change the passowrd and take full control. It’s okay. I think I am going to pass though. Best of luck with your project! How am I insulting you? I’m just protecting myself in this situation. That promptly ended my bid to do any work with him or his company. Do any of you run into this type of client every once and awhile? Or worse, have any of you ever gotten burned bad by a client? While somewhat basic you may run into an issue with this if you already have XAMPP installed on your machine. XAMPP keeps all of these files located in the /xamppfiles/bin/ folder. Therefore you need to modify your ./configure line when installing DBSlayer. Not rocket science but it took me a few minutes to debug. Hopefully this saves someone some time. The first method involves tricking DNN’s Tab table to thinking your URL link is something a little bit different. Look for the URL field of the external link you wish to open in a new window. Once you save restart the application in the Host -> Host Settings page and view your link you should be good to go! A little DNN hacking never hurt anyone. But it makes you wonder why they do not have this option implemented. And why they don’t validate external URLs when you add them.